The New York Yankees have turned one of their strengths into an even bigger strength. 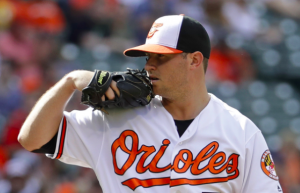 Tuesday night, the Yankees acquired relief pitcher Zach Britton from the Baltimore Orioles. As part of the deal, the Orioles have received three pitching prospects: Dillon Tate, Josh Rogers, and Cody Carroll. Britton got a late start to the season after rupturing his Achilles tendon in December. It wasn’t until the second week in June that the two-time all-star made his season debut. Since then, Britton has posted a 3.45 ERA across 16 appearances. However, Britton has turned it on lately, throwing a scoreless inning in each of his last eight outings. He looks to be regaining his old form as one of the best relievers in baseball. If that’s the case, he has a chance to make a meaningful impact for the Yankees down the stretch. Of course, New York’s bullpen isn’t exactly desperate for help. The Yankees already have the best bullpen ERA in baseball. Closer Aroldis Chapman has just one blown save this season. The likes of Dellin Betances, David Robertson, Adam Warren, Chad Green, and Jonathan Holder are also having strong seasons. Of those six, only Robertson has an ERA over 3 at 3.05. With Britton now added to that group, the Yankees may have one of the deepest and most talented bullpens baseball has seen in many years. They will be quite difficult to beat when holding a lead in the late innings. Adding Britton doesn’t reduce the team’s need to improve its starting rotation to the deadline. But the deep bullpen does help take some of the pressure off the starters as the Yankees look to catch the Red Sox in the AL East. More importantly, a deep and dominant bullpen could prove invaluable in the postseason. Meanwhile, by trading Britton, the Orioles have continued the fire sale that started when they traded Manny Machado to the Dodgers last week. As the Orioles start to rebuild, they’ve added three more pitchers who should be in the majors sooner rather than later. Tate is the highlight of the deal from Baltimore’s perspective. He was the 4th overall pick by the Rangers in the 2015 draft before going to the Yankees in the Carlos Beltran trade two years ago. His stock has dropped over the past couple of years. But he was still in the no. 9 prospect in New York’s loaded farm system. Carroll was rated no. 15 in that system, according to MLB.com. He’s posted a 2.38 ERA as a reliever in triple-A this season and should make his big league debut soon. Rogers is a less heralded prospect but has pitched to a 3.95 ERA in 19 starts at triple-A. With Britton being merely a rental player, the Orioles got a nice haul for him. All three pitchers acquired should contribute at the big league level in some way in the years to come. As for the Yankees, they now have a bullpen that can’t be matched in all of baseball. Adding Britton alone may not be enough to overcome a six-game deficit to Boston. But his presence will make New York’s bullpen a force to be reckoned with in October.